Baking soda – aka sodium bicarbonate, if you want to get scientific – is just one of those things that everyone should have because you can do so much with it. Seriously – in concentrated pastes, it’s a powerful (and natural) deep cleaner or a few cups added to a warm, comforting bath are amazing as a relaxing, health-boosting soak. Baking soda might just top the charts for the most versatile beauty ingredient. Don’t get baking soda mixed up with baking powder – while they’re similar, baking powder isn’t gonna give you the results that you’re looking for. Baking powders usually have weak acids in them, but we need our baking soda to be 100% basic (on the pH scale, obvi) made from sodium bicarbonate. The reason baking soda works so well is because it’s alkaline, and when combined with water, makes the water slightly more alkaline too. As soon as you add baking soda to water, you can feel the difference – the water feels a little more silky, without feeling outright slippery on your skin. Adding baking soda to your bath can reduce irritation and itching, and also provide detoxifying benefits. You can add up to 2 cups of baking to your bathtub for the perfect soak, but feel free to adjust this to your preferences. You can also do a couple things to totally prep your body to make the most of the bath, too. If you’re not hopping in the tub to sort out your skin (details on this further below) you’ll want to use a dry brush all over your body before getting in – it’s important to always brush in the direction of your heart to boost circulation, too. Dry brushing also helps get rid of any dead skin cells so you can get the most detoxifying and purifying benefits out of your bath. Want to know exactly what baking soda can do for you when added to a warm bath? Here are my top 8 reasons why you should be doing a baking soda soak on the regular. Eczema is an incredibly common, yet not exactly curable skin condition – and only eczema sufferers know how itchy and uncomfortable it can be (including me!). Studies have found that frequent baking soda baths can help to relieve the itching that eczema usually comes with. Getting rid of that itchy feeling is key to soothing flare-ups and healing skin. 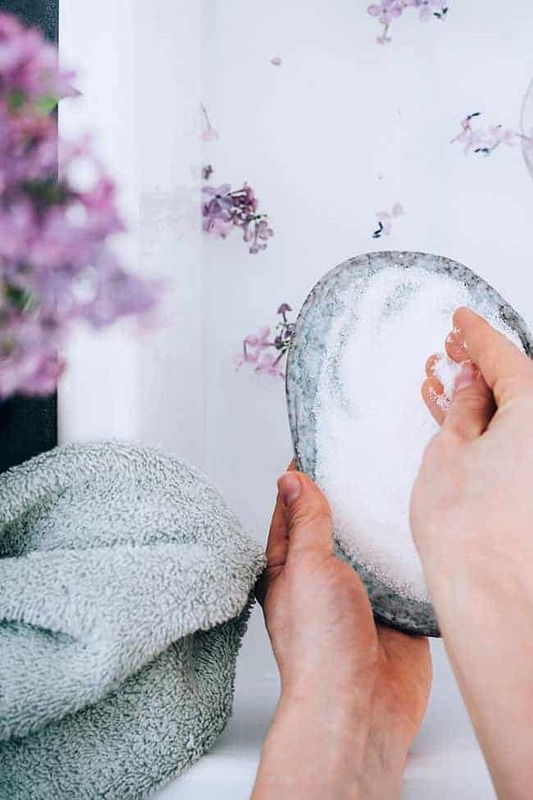 When it comes to using baking soda baths to treat eczema, it’s super important that you use lukewarm, rather than steaming hot water – which can dry and damage your skin even further. If you’re feeling sluggish and under the weather for no obvious reason, you might just need a detox bath to perk you up again. Baking soda is amazing for cleansing and detoxifying your whole body, boosting your immune system and eliminating any toxin build-up. Drawing impurities and toxins out of the skin, while softening at the same time–is there anything baking soda can’t do?! 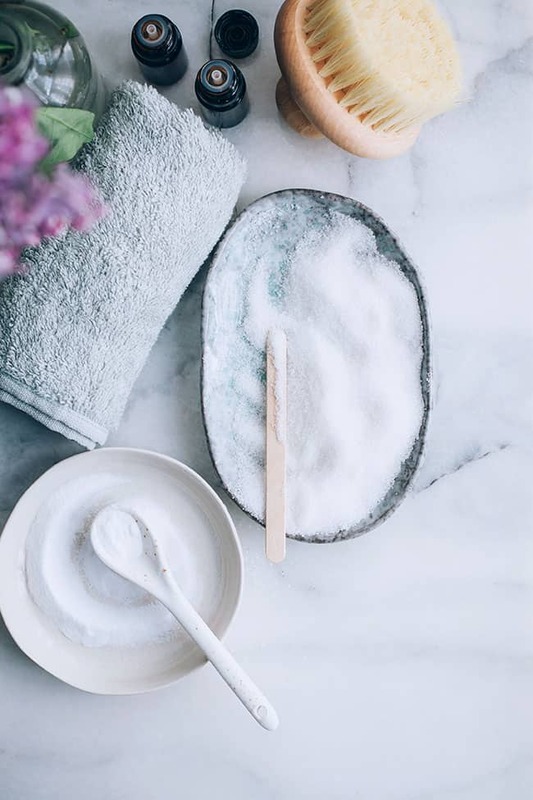 Combined with another must-have for everyone’s medicine cabinet, Epsom salts aka magnesium sulfate, baking soda is perfect for soothing sore muscles after a gym sesh. Recovery is key to making progress at the gym – so be sure to do a muscle soak at least once a week. I’m pretty sure there isn’t a woman alive that’s never had a UTI before – urinary tract infections incredibly common, but we all know how embarrassing (and stressful!) they can be. A nice, long soak in a baking soda bath can help relieve the discomfort of a UTI – alongside your doctor’s treatment plan, of course. If you’ve accidentally grabbed some poison ivy or poison oak leaves, baking soda is a perfect natural remedy. A few cups added to a warm bath will help relieve the itching – or, for a more concentrated treatment, a paste of water and baking soda can be directly applied to the skin. Like eczema, psoriasis can be treated with a medicated baking soda bath to help relieve itching and overall, heal symptoms of psoriasis. 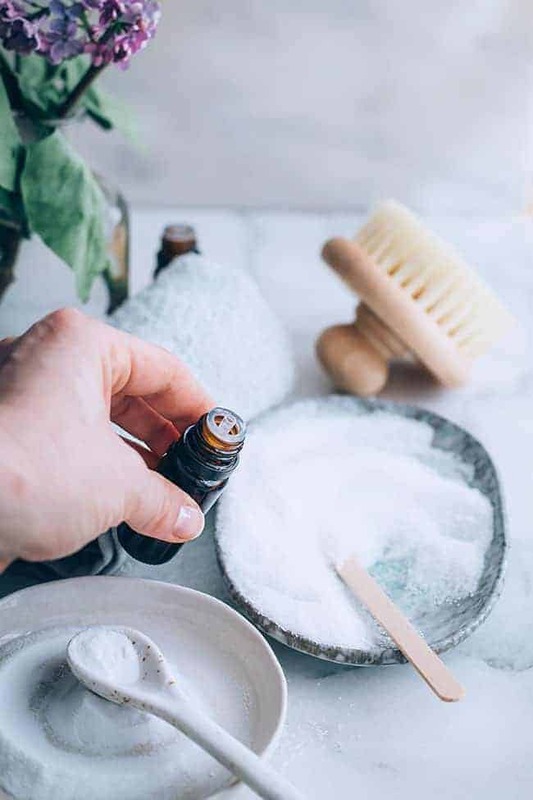 Because it’s an autoimmune disease, baking soda soaks won’t be able to cure it completely – but they’re super effective for relieving the itching and healing the irritated, sensitive skin. This might be a little TMI, but baking soda has unique anti-fungal properties that could help resolve skin or nail fungus issues. The fungus will sometimes show itself as a discolored nail (girl, I hope you didn’t go to a sketchy nail salon!) or a or an odd rash – having regular soaks in a baking soda bath can help stop any itching and get your skin back to normal. Baking soda baths aren’t just for adults – baking soda is safe enough for babies’ skin, too. Adding a few teaspoons to a baby’s bath can help soothe and heal their sensitive skin from diaper rash – totally naturally. Dry brush your skin before bath, vigorously brushing in upward motions to prepare skin. Pour the baking soda mixture in your bath while running warm water and enjoy a nice soak! After say, 40 minutes or so, you should be feeling amazing and will have gotten the most benefits out of your baking soda bath. When you’re ready to get out, don’t forget to give yourself a super thorough rinse – this makes sure there’s nothing lingering on your skin before you go ahead with your regular routine. You should be feeling super relaxed and your skin should feel amazing – all thanks to baking soda! Mix the baking soda and Epsom salt together in a bowl and add the essential oils. The oils will be absorbed into the baking soda and salt, as opposed to sitting on top of the water in your bath. Add to a warm bath and soak for 20-40 minutes. Can repeat up to twice a week. I don’t even know about that! I use baking soda to make green cleaning products only. I mix it with lemon or lavender essential oil when want to clean my house without any harmful residue. It really works well. Now I know about new opportunity to use baking soda! Cool. I did not know that. I do epsom salts and essential oils but I never thought to try baking soda. Thanks for the heads up! Filling up the tub now….thanks! Product and have this in the pantry!!!!!!! Ahhhhhhhhhhhhhhhh!!!! I really know today why we should use baking soda. Thank you so much for showing this blog full information. I was enjoyed to read your article. That’s funny… I am getting my bath ready for that right now. I was just sitting down to get a breather when I read what u wrote. How about if there is no epsum salt,baking soda only can still work? Oh, that’s an interesting tip. I’ve been hiking all day long and my muscles are really sore so I’m going to add baking soda to my bath tonight. Thank you for sharing!